Each birthday marks a certain milestone in your life, and it is worth celebrating with the people you love most and really care about. So how to let your relatives and friends know they are welcome to your big party? The best way is to send them a gorgeous invitation card stating the date and place of this festive gathering. Want to learn how to make a birthday invitation card that will instantly catch their eye? Check out these 5 easy steps and create memorable invitations to attract dear guests. 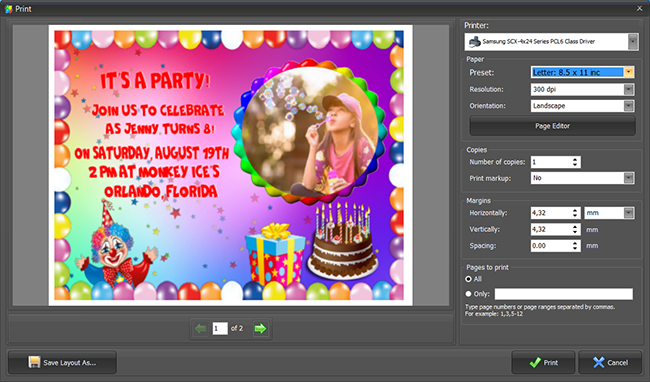 With the help of invitation making software you will be able to create one-of-a-kind invitations in a few clicks. Photo Collage Maker unlocks your creativity and gives you a chance to follow your imagination regardless of your digital experience. 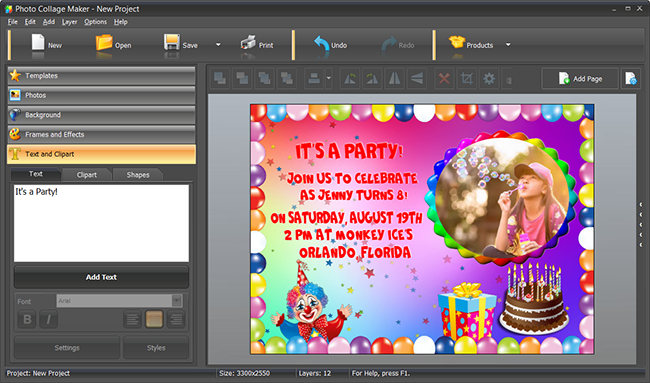 Now you can easily recreate the eye-catching design you have seen earlier or make your own custom birthday invitation using the editing and decorating tools this application provides. If you are not sure you can design your first invitation card from scratch, you can use the ready-made templates that come with the application. 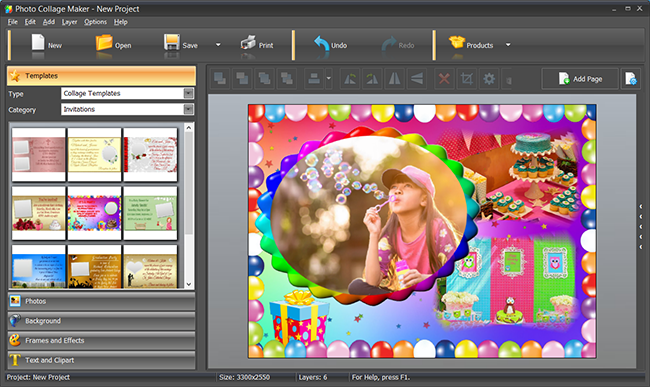 Photo Collage Maker software offers you a great selection of themed templates designed to express a range of aesthetic moods and fit various occasions. From wedding and christening to graduation and birthday invites, this built-in collection offers you a perfect base for your own creative designs. Choose some template that speaks to you, and then enjoy the exhilaration of customizing it. Ask yourself how to make a birthday invitation card really personal, and you will instantly think about the right photo to put into center of your design. It can be a picture of the happy celebrant, all the people invited to the party or a table set for the festive dinner. Add the images you want to the card, arrange them and apply some fancy masks or frames to draw the viewers’ attention. With dozens of pre-designed layouts and the built-in library packed with awesome masks, frames and clipart images, making a perfect birthday invitation is ridiculously easy, but it is important to type in the text of invitation. It is not just what you say, it is also how you say it. The font and color of your text caption are the best tools to express your true feelings behind the words. 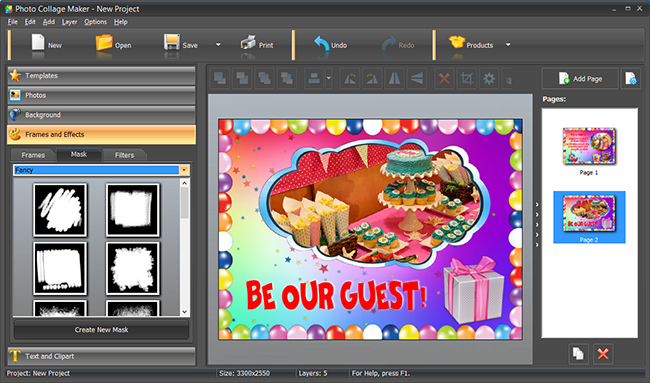 Switch to the Text and Clipart tab and pick the style that communicates everything you want to say. In this case, it is better to choose big roundish letters and bright colors to create the festive atmosphere. How to make a birthday invitation more convenient to use? Think about creating the reverse side of your card. With the front page already designed, add a new one and customize it in the same manner. Move to the Background tab and replace the original texture or image with a new one. The Frames and Effects tab will provide you with all the embellishments you may need – classic, themed and modern frames; round, rectangular and gradient masks; and plenty of photo filters! After you have finished making your personalized birthday invitations, release them into the world, and spread the word about your big event. If you want to share your customized invitation on Facebook, Twitter and the web, click the Save button, and you will be given easy options for saving your card as JPEG, PNG or GIF and then posting it or emailing to your guests. 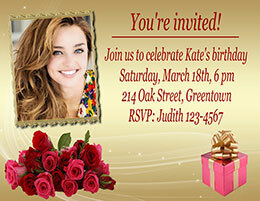 If it is a traditional gesture you are after, print your birthday invitation and send it in the mail! Now you know how to make a birthday invitation card and can set the tone for your once-a-year-bash. Brimming with personality and good cheer, this customized card will bring together all the people you love and give them the best moments of their lives. When the birthday party is over and the photos are printed, turn them into stunning collages and scrapbooks. 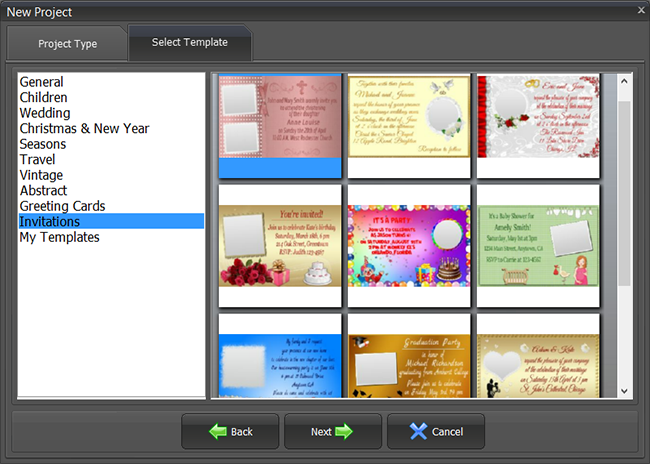 Create Merry Christmas collages for winter holidays, funny Easter eCards and any other designs you can come up with!